Trend colors have been commonplace in fashion for decades. But also in terms of interior design, it is literally becoming more and more fashionable to choose trendy colors and give their living rooms a special accent. How to keep up with trends is something that has to be left to one side, but one thing is for sure: the color design significantly influences the sense of well-being. This is especially true for the bedroom. Which trend colors will appear on the radar in 2019 and how will they affect each other? More about this can be found in the first part of our trend color report 2019. 1 Who actually determines trend colors? Who actually determines trend colors? Before we devote ourselves to the trend colors for hopefully pleasant dreams in the home bedroom, we want to clarify the question of who actually calls these color trends into being. After all, trends do not just happen or grow randomly on the trees, but are deliberately launched. We know who the usual suspects in the fashion world are. Behind trend colors, which also affect fashion, are usually institutions, companies and artists, which at least the majority of the public is unlikely to know. One of these luminaries, for example, is the US-based company Benjamin Moore & Co., which was founded in 1883 and has already received numerous awards for its color creations. Other trend-setters whose color favorites have also made it into our selection are the architectural paint brand Dulux and the Pantone Institute, which has been leading the way in color trends for 19 years. Since all three sources each proclaim a different top trend color for the year 2019, it remains the individual taste reserved, which color fits best into your bedroom. Let’s start with the trend color of the Patone Institute. The choice this year was blue-based, strong Ultra Violet. According to the color experts of the institute, the color provided with the color code “Ultra Violet 18-3838” leans against the color of a clear night sky, as it is still to be found today, above all, far away from civilization. Accordingly, the shade provided with deep purple nuances appeals to the primal instincts deeply anchored in the brain and thus has a meditative and calming effect. According to classical color theory, this particularly strong violet can be perfectly combined with white or lavender to give the bedroom extra width. If you want it to be especially “starry”, first stroke the bedroom ceiling in Ultra Violet and then dabbed small dots with fluorescent paint to create the illusion of a calming starry sky. In a similar but somewhat gentler direction is this year’s trend color purple. In contrast to the strong Ultra Violet, however, this is a Lilaton with a significantly increased proportion of white. This gives the base color a certain lightness, without the positive color association suffers. A covered Lilaton is ideal for smaller bedrooms, as it makes the room appear much larger than a painting in the aforementioned trend color “Ultra Violet”. In addition, the sound can be perfectly combined with white, pink and gray tones to give the bedroom that certain something. If you also use your bedroom as a retreat for creative work, a soft purple also has an inspiring effect – at least that’s what you say after the color after the classical color theory. 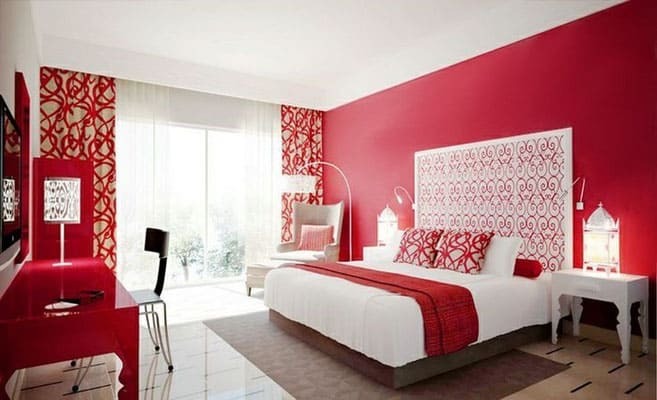 Even the color red in 2019 is in vogue both in fashion and in the area of interior design. However, Benjamin Moores & Co. has declared a very special shade of red to be its own favorite. The fiery tone “Caliente AF-290” stands for energy, change and passion and is therefore ideal for accenting your bedroom, as long as you can identify more with these character traits. However, due to the power of the paint, you should not paint the entire bedroom in Caliente red, but only individual walls. You want to know which living room colors are trendy in 2019? Here you can read the second part of our trend color report 2019 with all trends for living room design. For all questions, a detailed consultation or an individual planning we are at your disposal. Just contact us.